1 bottle of Conserva Della Nonna passata from our deli. A glug of extra virgin olive oil. Either a chopped medium onion OR three cloves of garlic (you can use both if you like!). Heat your olive oil up, add chopped onions & sauté. If you are using garlic, be careful it doesn’t burn as it will become bitter. Add your passata, swill the bottle out with water so you get every last bit of goodness out. Add a couple of pinches of salt and black pepper. Bring to the boil then lower the heat to let it simmer for at least 30minutes to an hour before eating. The longer the sauce is simmering the more intense the flavour will be. If it reduces add a little of water to loosen up the sauce. Pasta sauce is always better the day after! This is your basic sauce, you can always liven it up by adding, basil, mixed vegetables or mince meat. You can also add Roma homemade meatballs or fresh sausages to the sauce! 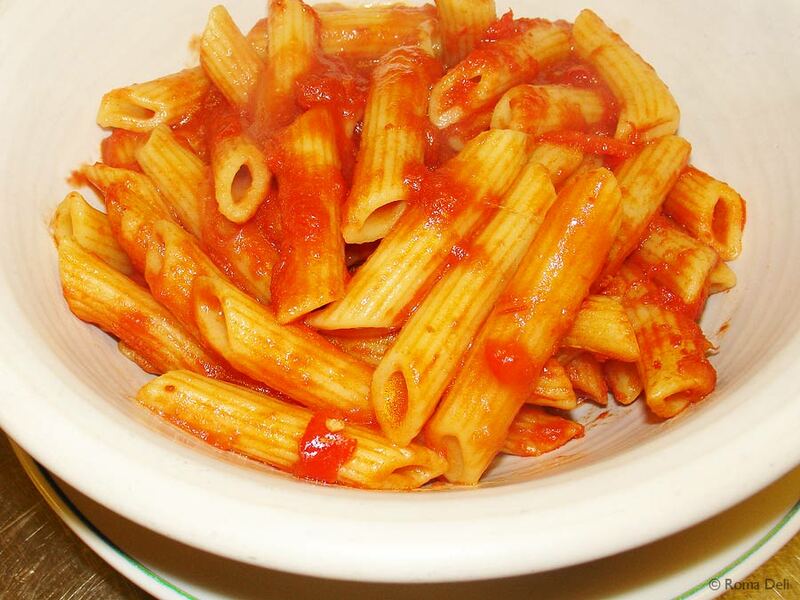 If you want to make an even quicker meal, you can always use on of our Roma homemade sauces. Simply heat up and you are good to go! Serve from a choice of our wide range of Molisana pasta. Bring a pan of salted water to the boil and add your pasta. The amount of time depends on the type of pasta (don’t worry it says on the pack). A tip is to try it, bite into it and if it is still a little white in the middle, it isn’t ready yet.